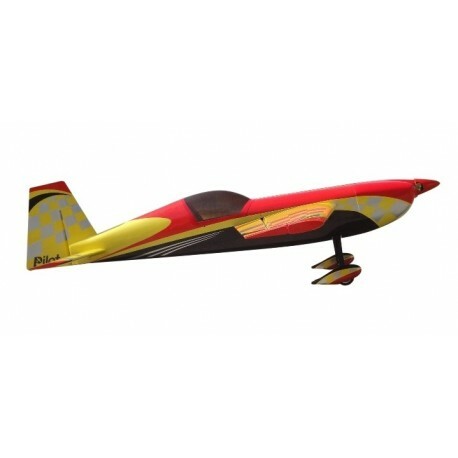 Aerobatic Pilot RC model EXTRA 330SC 2700 mm is specially designed for 3D and precision aerobatics classic but fun with it and enjoy a holiday weekend when flying, absolutely. It features a solid but very light structures made of balsa and plywood with extensive use of carbon and fiberglass components and braces from aluminum alloys. 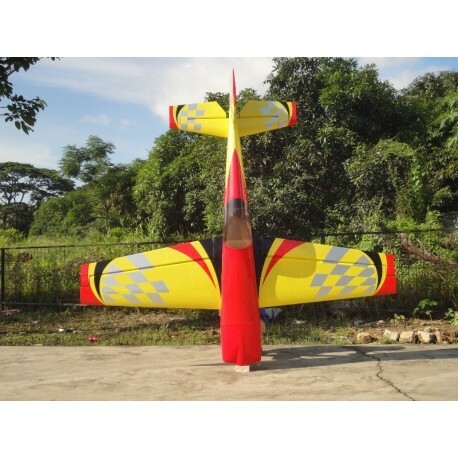 EXTRA 330SC 2700 mm is designed to drive the 100-120 cc petrol engine. ARF kit for Pilot RC is typically very high readiness - all airframe parts are obviously prepared and coated iron sheet Oracover - but it does not stop! All rudder hinges are installed, as well as the cable raceways rudder and rudder rods. Fiberglass engine covers are painted and pre-installed - just cut any remaining openings according to your engine and muffler. The fuel tank is installed. Canopy is preassembled and sprayed. 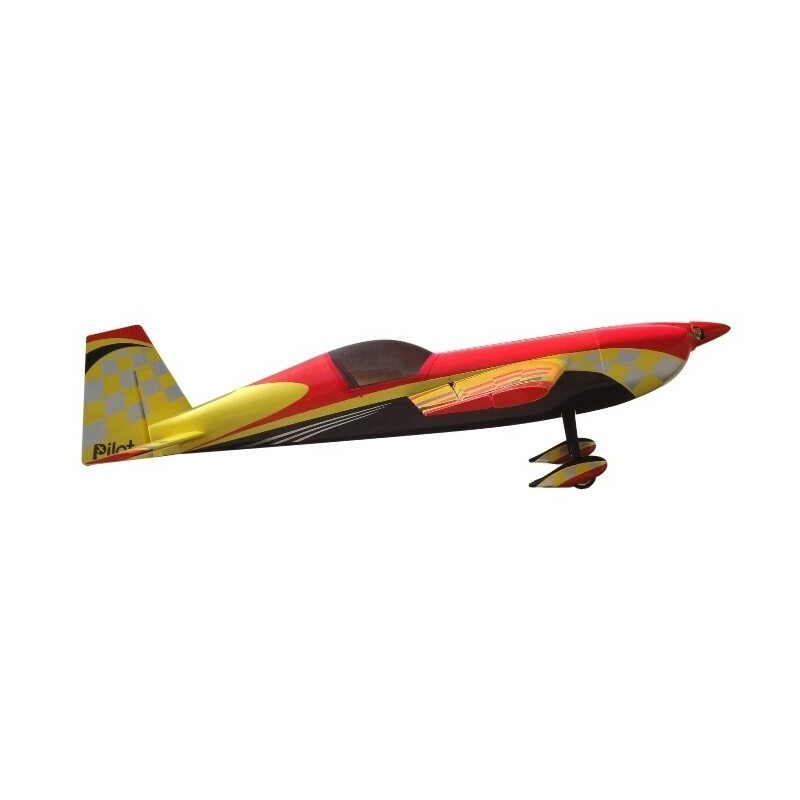 For the aileron servos are offered three shafts allowing the use of one central servo or a pair of servos. For easy transportation of the two-piece wing with a carbon tube coupling as well as the horizontal tail surface. 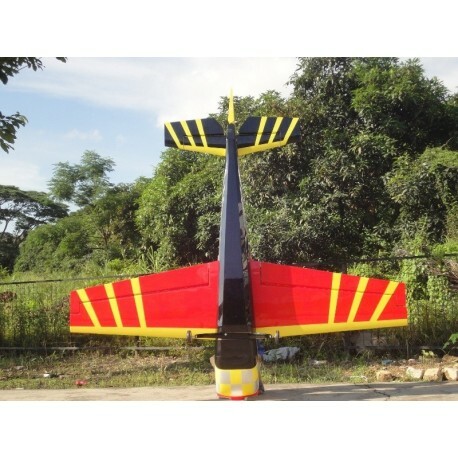 You can also easily disassembled rudder hung on hinges with steel pin and continuous chassis mounted screw. Concision - you have to look forward to! Nine-channel RC 2.4GHz computer set (AFHSS with telemetry) with crosscuts. Transmitter with Tx Battery, Optima Receiver 9. Backlit Touch LCD Display. Extremely strong extension cable with 1000 mm thick JR connectors with silicone insulation, conductor cross section 0.35 mm2. Made in Germany. Super-strong extension cable with 1000 mm thick JR connectors with silicone insulation, conductor cross section 0.50 mm2. Made in Germany. Twisted, very strong extension cable with 100 mm JR connectors with silicone insulation, conductor cross section 0.35 mm2. Made in Germany. Twisted super strong extension cable with 100 mm JR connectors with silicone insulation, conductor cross section 0.50 mm2. Made in Germany. Twisted, very strong extension cable with 250 mm JR connectors with silicone insulation, conductor cross section 0.35 mm2. Made in Germany. Twisted super strong extension cable with 250 mm JR connectors with silicone insulation, conductor cross section 0.50 mm2. Made in Germany. Twisted, very strong extension cable with 350 mm JR connectors with silicone insulation, conductor cross section 0.35 mm2. Made in Germany. Extremely strong extension cable with 350 mm JR connectors with silicone insulation, 0,50 mm2 conductor cross section. Made in Germany. Twisted, very strong extension cable with 500 mm JR connectors with silicone insulation, conductor cross section 0.35 mm2. Made in Germany. Super-strong extension cable with JR connectors, 500 mm long, with silicone insulation, 0,50 mm2 conductor cross section. Made in Germany. Extremely strong extension cable with JR connectors 50 mm long with silicone insulation, conductor cross section 0.35 mm2. Made in Germany. Twisted, very strong extension cable with 750 mm JR connectors with silicone insulation, conductor cross section 0.35 mm2. Made in Germany. Super-thick extension cable with 750 mm JR connectors with silicone insulation, conductor cross section 0.50 mm2. Made in Germany. Digital Jumbo Servo 197g with metal gear for giant models. 2xBB, pull 19.8 kg / cm, speed 0.19s / 60th at 4.8V. Digital servo with increased supply voltage up to 7.4V (2xLiPOL), metal gears, coreless motor. Designed for giant models and other challenging projects. Strong flat two-core power cable with 200 mm Futaba connectors with silicone insulation, conductor cross section 0.50 mm2. Made in Germany. Strong flat two-core power cable with 200 mm JR connectors with silicone insulation, conductor cross section 0.50 mm2. Made in Germany. Super-thick, servo cable with a 300 mm JR connector with silicone insulation, conductor cross section 0.50 mm2. Made in Germany. Twisted, very strong servo cable with a 300 mm JR connector with silicone insulation, conductor cross section 0.35 mm2. Made in Germany. Twisted super strong servo cable with JR connector (lengthwise) 300 mm with silicone insulation, conductor cross section 0.50 mm2. Made in Germany. A small design switch with a fuel valve will raise the model to a higher level. Twisted three-core cable very thick in JR (brown / red / orange) with silicone insulation, conductor cross section 0.35 mm2. Highly flexible, 88 strand strands 0.07 mm, max. 48V, 8A. Diameter 1.5 / 3. Easy, fast and accurate length adjustment! Adjustable pull rod in the same way as the RC Special Vehicle Couplings. Decorative mat M3 wide blue 10pcs"
Decorative Washer Wide for M3 Bolt with Round Head, 15mm Diameter"
Double velcro fastener made of solid material. Used to hold tank or lipol batteries in giant aircraft models. Magnetic fuel valve + Smoke vent valve. The most common double valve in gasoline models. Special hexagon socket set key. Intelligent organizer not only for hoses but also for cables or antennas. Dimensions of the carbon base - Length 175mm, Width 20mm.